On February 7th, representatives from the SAPD, Chief McManus, Councilman Treviño, the City of San Antonio’s Traffic and Capital Improvements department, Parking Enforcement, and Assistant City Manager, Peter Zanoni, met with residents about parking and safety concerns in the neighborhood. SAPD has followed up with an action plan, which you can view here. In addition, SAPD met with representatives from the businesses along N. Saint Mary’s on February 14th. 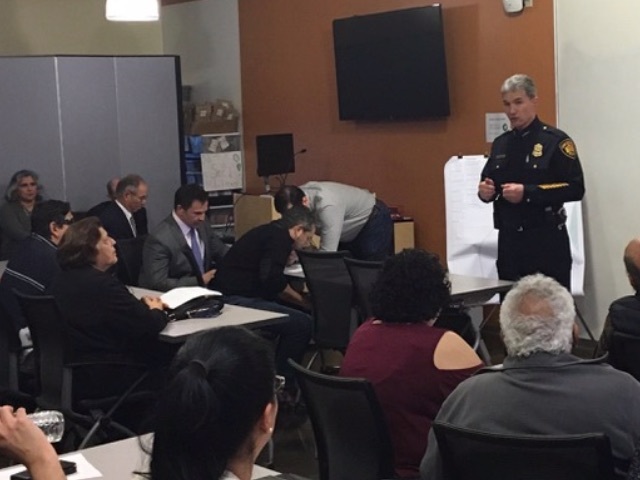 They discussed the concerns of the neighborhood and provided the businesses with an overview of the actions SAPD and the city will be taking to address safety and parking. Additionally you may follow up with Joe Frank Picazo, Assistant to the Director, San Antonio Police Department at Joefrank.Picazo@sanantonio.gov or 210-207-8430. View the N. St. Mary’s Public Safety Meeting Follow-Up Comprehensive Plan here. We are looking forward to seeing you at our Annual Meeting next week. The Nominating Committee has compiled the list of nominees for the 2019 Board election which will take place at this meeting. You can view the nominee bios here. You must be current on your THCA Membership to vote for the Board, so if you have not done so already, please take a minute to renew today. Our Annual Meeting will have a full agenda. In addition to the vote, we are looking for volunteers for the new committees we have planned for 2019. There is a new Social Committee who are working on a neighborhood-wide Fiesta event, and we are hoping to form a committee specifically to address our parking issues. 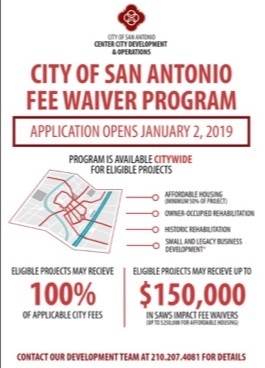 We have some wonderful community partners, and 2019 is already shaping up to be a great year in Tobin Hill. You won’t want to miss this meeting. 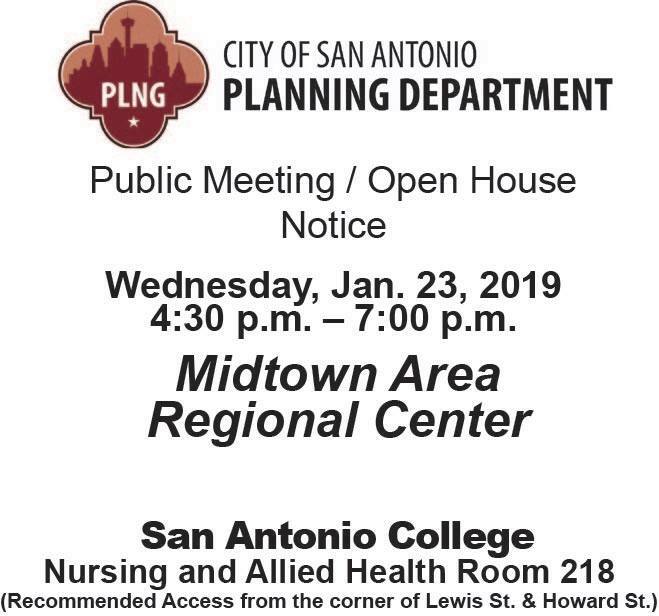 A couple of highlights about upcoming events: The City of San Antonio is hosting an Open House on Wednesday, January 23, to update us about the SA Tomorrow Midtown Regional Center plan. 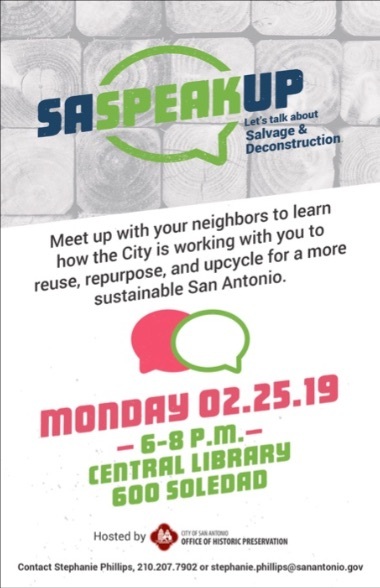 There are some interesting neighborhood engagement events coming up on Saturday, Jan. 26: a Property Tax workshop hosted by the Bowen Center, and a Neighborhood Design workshop hosted by the San Antonio Conservation Society. Finally, our Social Committee has starting working on what we hope will become an annual Fiesta event: make sure you Save the Date for Tobin de Mayo on May 4, 2019! A reminder from our neighbors at Metropolitan Methodist Hospital: it’s flu season so wash your hands! Hand washing is the most effective way to prevent the spread of germs and infections!! 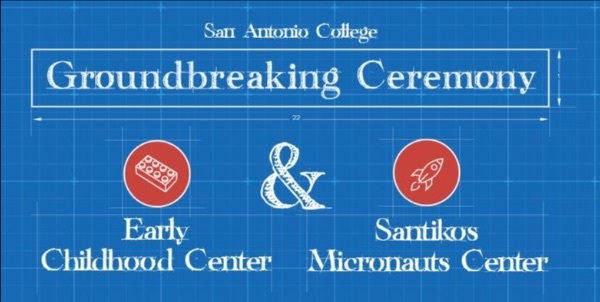 We are looking forward to seeing you at our Annual Meeting on Thursday, January 24 at Eco Centro at 6:00PM. We have begun collecting your dues for next year. Please read through the nominee bios here. Social to follow the meeting at the Kushner’s home. 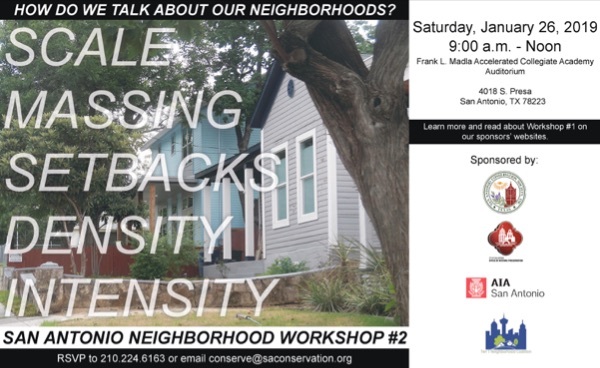 Please join the San Antonio Conservation Society, the City’s Office of Historic Preservation, AIA San Antonio, and Tier One Neighborhood Coalition for the second of four neighborhood workshops where we will focus on how we develop the common language of design as we work to retain the physical and economic-social character of our neighborhoods. The workshop is open to all at no cost. Hosted by The Bowen Center for Neighborhood Advocacy, Inc.
Join us as we learn about property taxes and market values. BCAD experts will guide us through the taxation process. Rich Acosta of Mi Ciudad es Mi Casa will share how to protest your property taxes for free. Breakfast tacos and coffee will be served. This event is free. Please share with your neighbors. Register online for free on the Bowen Center Website. 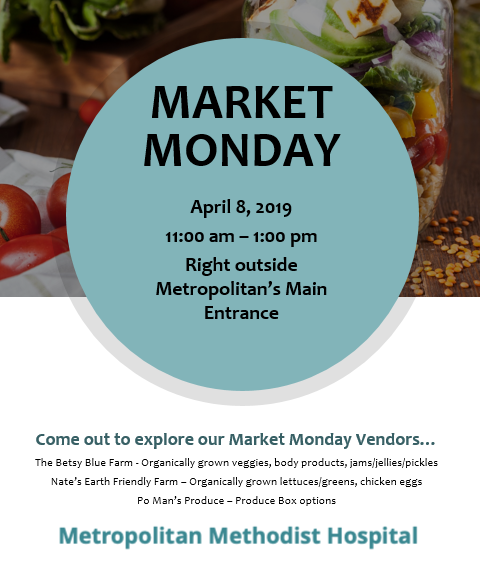 Market Mondays at Metropolitan are held weekly beginning this Monday, January 21, 2019 from 11am to 1pm! The market is held at the front of the hospital. 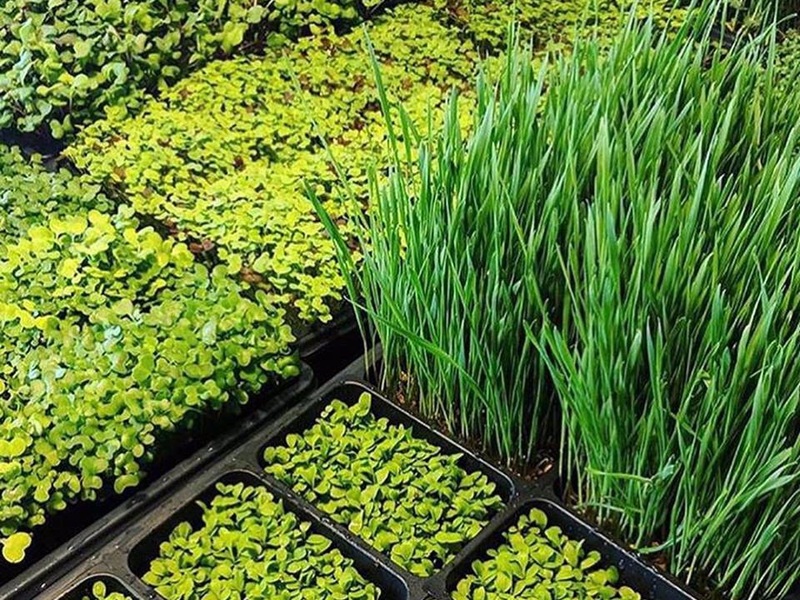 It is growing in size as more vendors are added weekly. For more information or if you know of any interested vendors please get in contact with Vanessa Wilsonat Metropolitan Methodist Hospital . There is currently no vendor fee. THCA’s Zoning and Development Committee meets bi-weekly (as needed) to review upcoming zoning cases in the neighborhood. The next meeting will be Tuesday, January 29th at 6:30PM. Please contact Zoning and Development Chairperson, Rick Schell, to confirm the location of the meeting. THCA’s Historic Preservation Committee meets monthly to discuss cases scheduled to go before the City’s Historic Design Review Commission. The next meeting will be Monday, January 28th, at 6:30PM. Please contact Committee Chair, Ricki Kushner, for meeting location details. 2019 is a new year and there are plenty of spots on THCA’s committees. Social Committee, Outreach, Community Service, Special Events, and more! Let us know at info@tobinhill.org! 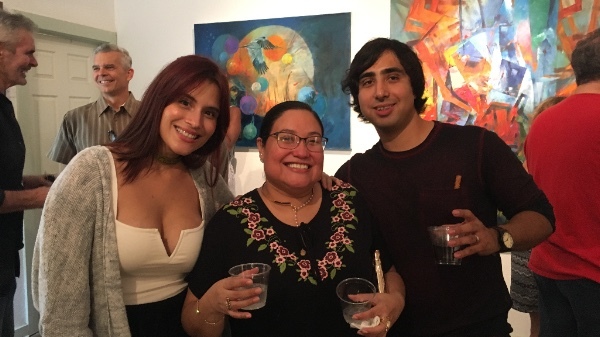 THCA celebrated the holidays together at Casa Rosa, the gallery of Luis Lopez. We sang carols around the piano and shared delicious food and friendship, as well as enjoyed a visit from Congressman Lloyd Doggett. Be sure to check out the photos on the THCA Facebook page. Our Annual Meeting is coming up in just a few weeks. The Nominating Committee has compiled the list of nominees for the 2019 Board election which will take place at this meeting. You can view the nominee bios here. You must be current on your THCA Membership to vote for the Board, so please make sure you have renewed before then. 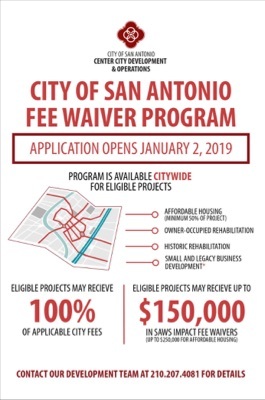 Beginning in January, the City of San Antonio is expanding the Fee Waiver program for qualified Owner Occupied, Legacy Businesses, and Historic Rehabilitation projects. Please click on the flyer at the bottom of the newsletter for more details. Social to follow the meeting. High Wire Arts Studio, 326 W Josephine St. Interested in hosting a Social during 2019? 2019 is a new year and there are plenty of spots on THCA’s committees. Social Committee, Communications/Newsletter, Community Service, and more! THCA’s Zoning and Development Committee meets bi-weekly (as needed) to review upcoming zoning cases in the neighborhood. The next meeting will be Tuesday, January 8th at 6:30PM. Please contact Zoning and Development Chairperson, Rick Schell, to confirm the location of the meeting. The Nominating Committee has compiled the list of nominees for the 2019 Board election. You can view the nominee bios here. The election will take place at our Annual Meeting on Thursday, January 24, 2019. You must be current on your THCA Membership to vote for the Board, so please make sure you have renewed before then. 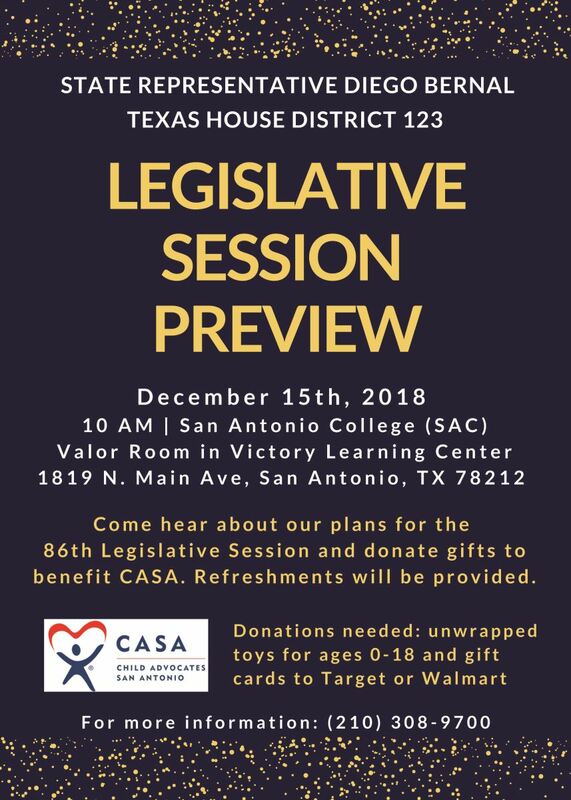 We are looking forward to seeing you at our annual Holiday Party on Friday, December 14th at Casa Rosa. 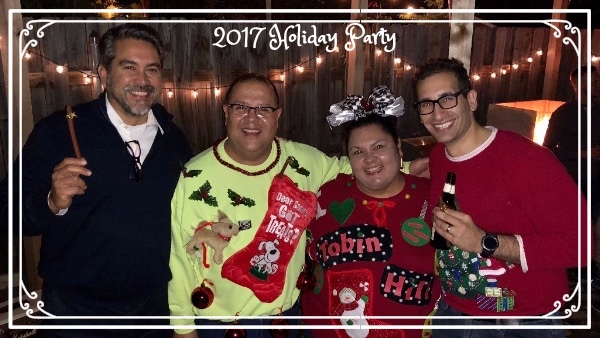 You’re invited: Tobin Hill Community Association Annual Holiday Party! Tamales and chili will be provided by THCA. Please bring a dish to share. You do not need to be a THCA Member to attend. We have begun collecting your dues for next year. 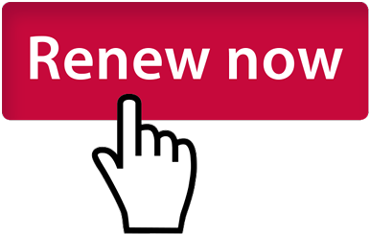 You can renew your membership in person, by mail, or online here. 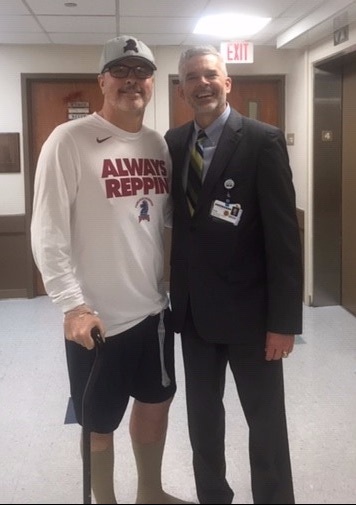 San Antonio, Texas – November 26, 2018 – Hospitality and the commitment to outstanding patient care provided by the leadership and staff at Metropolitan Methodist Hospital scored big with a college basketball coach during the 2018 NCAA Men’s Final Four in San Antonio.Coach Greg Herenda, 57, had not been in a hospital since he was born, but during a trip to San Antonio to see the Final Four in March 2018 he encountered a life-threatening condition that kept him in the hospital for 15 days.“I could not have picked a better place than Metropolitan Methodist Hospital,” he said. “My family and I were 2,000 miles away from our home in New Jersey, but the doctors and staff made us feel like family. I was in a bad situation and they worked hard for me. I will be forever grateful.”Read more on the THCA blog. THCA’s Zoning and Development Committee meets bi-weekly (as needed) to review upcoming zoning cases in the neighborhood. 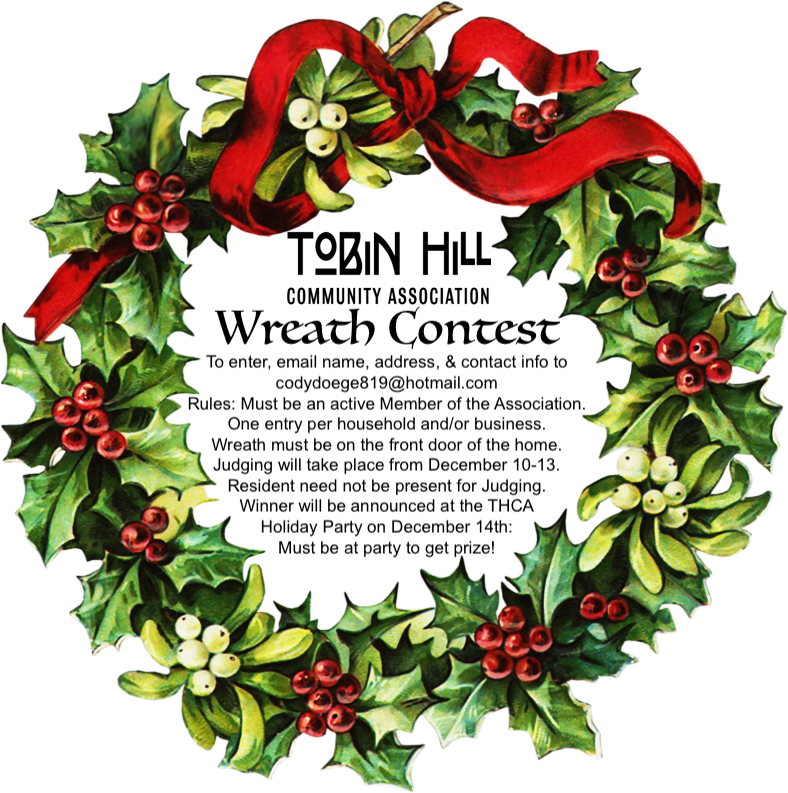 The next meeting will be Tuesday, December 11th at 6:30PM. Please contact Chairperson, Rick Schell, to confirm the location of the meeting. THCA’s Historic Preservation Committee meets monthly to discuss cases scheduled to go before the City’s Historic Design Review Commission. The next meeting will be in January. Please contact Committee Chair, Ricki Kushner, for meeting location details. Cody Doege, Resident, East Myrtle Street: Cody Doege was born and raised in New Berlin, TX, and earned his Bachelor of Science degree from SWT in San Marcos. Cody is an active Member of Christ Lutheran Church of Elm Creek and is employed by La Jolla Pharmaceutical. 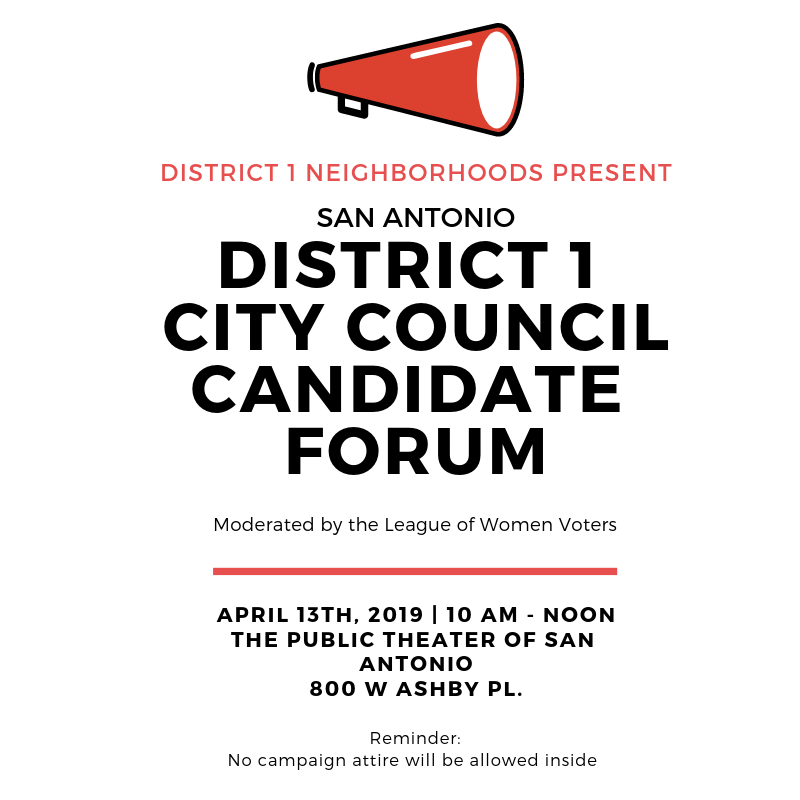 He has lived in Tobin Hill for nine years and his focus in the community is to engage and encourage sound growth through each Resident’s wants and needs. Municipal accountability and Compliance Strategies are of utmost importance. Cody is running for re-election for his fourth term as THCA President. Michael Cepek, Resident, East Courtland Place: Michael has been in Tobin Hill since mid-2008, when he bought a 1927 house on East Courtland Place, in the historic district. He is a Chicago native and came to San Antonio to work as a professor of cultural anthropology at UTSA. 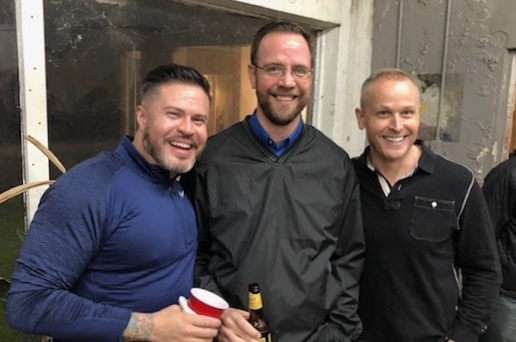 Within six months of his 2007 arrival, he knew he would stay for a long time, which is why he moved from an apartment in Monte Vista to Tobin Hill. Michael enjoys frequenting the clubs and venues on the St. Mary’s strip with his wife Amy Rushing, who is Head of Special Collections at the UTSA Libraries. He knows many of the owners and workers of businesses along the strip, and believes he can be a good connection to that very significant part of our neighborhood. Many folks here have seen him walking his three dogs–a rat terrier, a chihuahua, and a chihuahua-poodle mix–along our streets, and a few others have already met his mother, Char, who recently bought a home in Tobin Hill to get away from Chicago winters. Michael has long been interested in various neighborhood issues: keeping our homes and streets safe; working to maintain a good balance between Tobin Hill’s history as a mixed residential and business/entertainment district; and helping to make sure the neighborhood remains open and affirming for our many LGBTQ residents, as his brother is gay and his family has a long history of involvement with Parents, Friends, and Family of Lesbians and Gays (PFLAG). Michael is running for re-election for his second term on the THCA Board. Michael Finelli, Resident, Paschal Street: Michael Finelli grew up in Miami Florida, received a Bachelors of Art History degree at Florida International University. After graduation moved to the great San Antonio in 2011. My wife Rachel and I moved to the Tobin Hill community at the end of 2016 and shortly after welcomed our first baby Francine. Some of my hobbies are traveling, photography and always love attending local events. Larkin O’Hern, Resident, East Myrtle Street: Larkin and his wife Rachel bought a home in Tobin Hill in 2017 and (finally) moved in early 2018! After spending eight years in the Army bouncing from place to place, they were ready to put down roots and loved the community feel of Tobin Hill, its proximity to downtown, and mix of historic preservation with exciting potential. Larkin is a 2008 graduate of the United States Military Academy and holds a master’s degree from George Washington University-which he uses never. When not working at USAA Larkin enjoys “walking” along the Museum Reach and biking the Mission Extension and is a proponent for sidewalk and bike-lane enhancements. Blayne Tucker, Owner – The Mix on N. St. Mary’s Street: Mr. Tucker has worked on virtually every aspect of the music and entertainment business for a variety of clients including Cyril Neville, Bobby Valentino, and Gary Clark Jr. On behalf of Gary Clark Jr., Mr. Tucker has participated in every aspect of his career: management, business management, legal affairs, tour management, booking, promotions, marketing, publicity, merchandising, fan club interaction, and publishing administration. He is the founder of the North St. Mary’s Business Owners Association, served as Commissioner on the Tricentennial Commission when appointed by then Councilman Ron Nirenberg, and is owner of The Mix on North St. Mary’s St. Additionally, Mr. Tucker is the managing partner for Do210.com. San Antonio’s premiere event calendar listing providing the most comprehensive event database for local and national events. Mr. Tucker was in private practice handling a wide variety of cases that involved: business litigation, multi-district litigation, criminal defense, business transactions, international law, wills and probate, personal injury, divorce, child custody, adoption, and appeals before the Court of Veterans Appeals and Air Force Board for the Correction of Military Records. Mr. Tucker has practiced extensively in both state and federal district and appellate courts. Mr. Tucker completed his B.S. from the University of Nevada Las Vegas in just over two years, as well as attaining his J.D. from Texas Wesleyan University School of Law in Fort Worth, Texas. Blayne is running for re-election for his second term on the THCA Board. Beth Schleif, Director of Business Development, Metropolitan Methodist Hospital: Beth is excited for the chance to participate in the Tobin Hill Community Association as she grew up with parents very active in their own community association in her hometown of Clear Lake, outside of Houston, and experienced the benefits of residents and businesses working together. Beth attended Southwestern University in Georgetown, Texas, where she played basketball for the school and participated in Greek life. 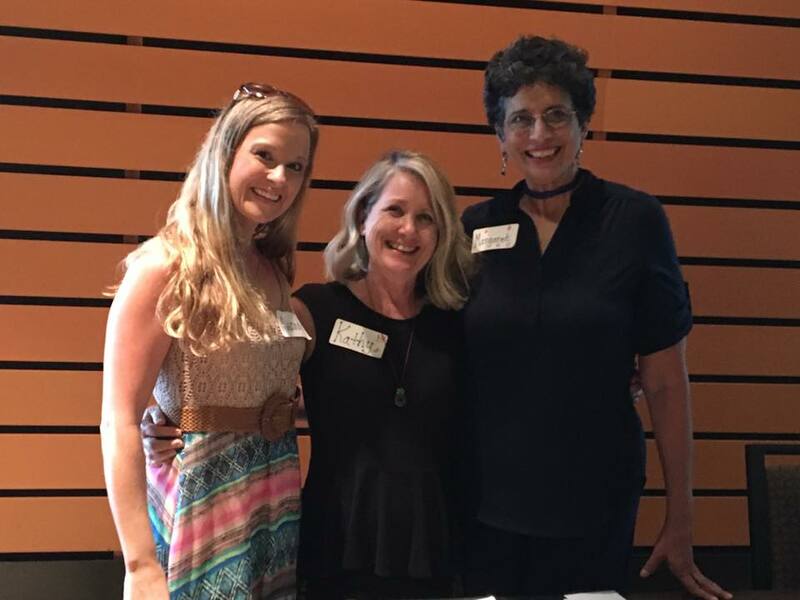 After completing her bachelors degree, Beth moved to San Antonio in 2008 and began work in fundraising and development with the McNay Art Museum. She later moved to Institutional Advancement for UT Health where she found purpose and inspiration in advancing research and treatment in medicine, particularly seeing the positive impact it had on patients. With a desire to do more in the healthcare world, Beth decided to pursue a Masters in Healthcare Administration at Trinity University. She found her home at Metropolitan Methodist Hospital when doing her Administrative residency year, and stayed on board as an Associate Administrator after completing her degree in 2015. In this operations role Beth had the chance to collaborate with many department teams while implementing the patient food services room service model, overseeing construction projects, and leading employee engagement initiatives. In 2017 Beth transitioned to the business development role and has enjoyed the work she now gets to do, partnering with physicians in both the hospital and community. Outside of the hospital Beth enjoys participating in the ministries of her church, Laurel Heights United Methodist, where she sings in the choir, volunteers with the youth group, and serves on the Staff Parish Relations Committee. Thank you to all of the members who are willing to serve as Board Members for the Community Association. We hope you had a great holiday weekend. The Tobin Hill Community Association is so thankful for our neighbors. 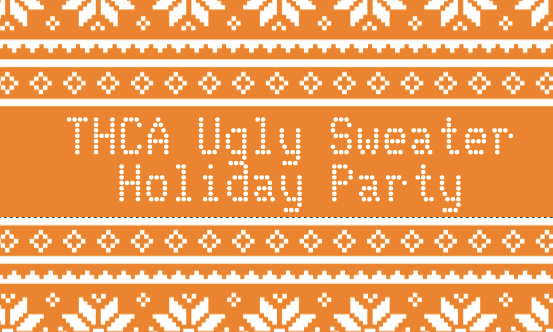 Our November public meeting is coming up this week on Thursday, and we’ve scheduled our annual holiday party for December 14th. You won’t want to miss these and other upcoming events. Social to follow the meeting at Plaza Guadalajara. 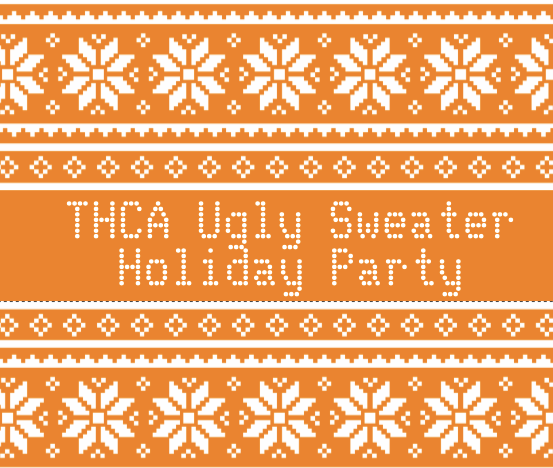 Tamales and chili will be provided by THCA. Please bring a dish to share. It’s officially time to start signing up for your 2019 THCA Membership! Start getting your finances in order as we will start collecting your dues for next year now. You can renew your membership in person at the THCA Public meeting on Thursday, November 29, by mail, or online here. THCA’s Zoning Task Force meets bi-weekly (as needed) to review upcoming zoning cases in the neighborhood. The next meeting will be Tuesday, November 27th at 6:30PM. 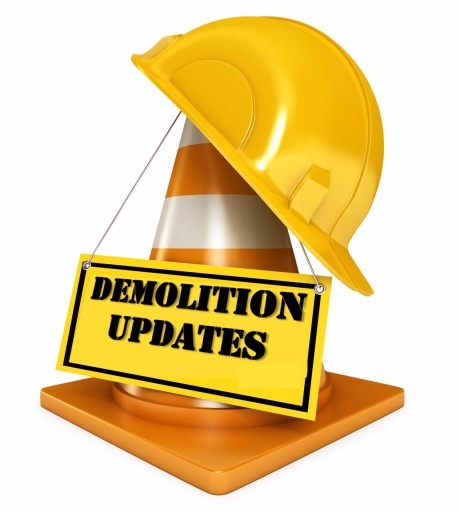 Please contact Zoning Task Force Chairperson, Rick Schell, to confirm the location of the meeting. THCA’s Historic Preservation Committee meets monthly to discuss cases scheduled to go before the City’s Historic Design Review Commission. The next meeting will be Monday, November 26th at 6:30PM. Please contact Committee Chair, Ricki Kushner, for meeting location details. A quick update: last night members of the Association met to adopt the proposed bylaw amendments. Unfortunately, we did not have enough members in attendance to vote on the amendments. We will be presenting the amendments at our next general meeting on November, 29. Please mark your calendar and plan to be there for this important meeting! We know that the next few months will be a busy time for everyone. Here is a quick reminder of upcoming events in the neighborhood. You can renew your membership in person at the next Second Friday Social on November 9th, the Public meeting on November 29, by mail, or online.